Handmade stationery boxes are great gifts. Making a special present for a friend can be inexpensive in all ways but the time it take you to make it. I wanted to give a unique handmade gift to Alison, a special friend, to thank her for her friendship, and I think this little box with its eight handmade greeting cards showed her how much I value our friendship. Alison is a crafter too so knows how much time it takes to make such a gift so that adds to how special it is for her. "What is bought is cheaper than a gift." Make the bottom of the box like the top instead of cutting away the sides as for the bottom of the Explosion Box. 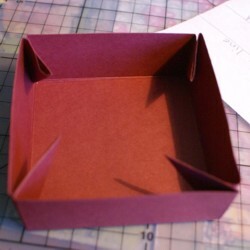 Follow the lid pattern instead, drawing a line diagonally from the bottom of the box to the corner and fold the sides up, like I have on the Explosion Box lid. Be sure to use the same dimensions as for the bottom of the Explosion Box. It is then a simple matter to make cards to fit the box. 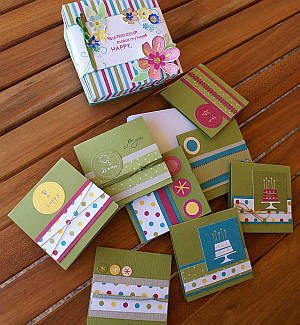 Make one card first and test to make sure it fits in your new box. 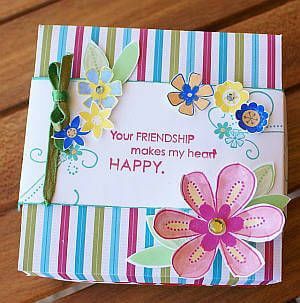 Use this card as a template to cut out the next seven card blanks, and decorate them to your taste to suit your friend or the occasion. I add in some hand made envelopes too. I cut a belly band to fit all the way around the bottom of the box. 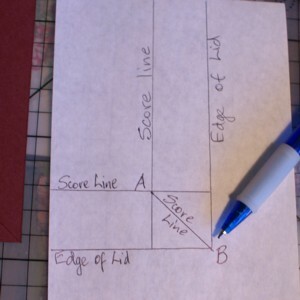 Score it where it needs to fold around the box by attaching one end of the belly band to the box first, then scoring where the belly band meets the corner of the box. I decorated the top by scallop punching a red paper edge for it, then covering it with double sided paper and adhering it so the scallops showed around the edge of the lid. 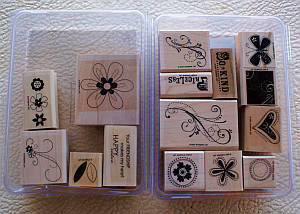 The stamp sets I used were from Stampin' Up! They are the Friendship Blooms and Priceless sets, both retired now. 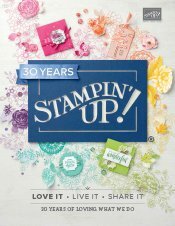 You can view the current Idea Book and Catalogue to discover new stamp sets and accessories that will also look lovely on your handmade cards and box. 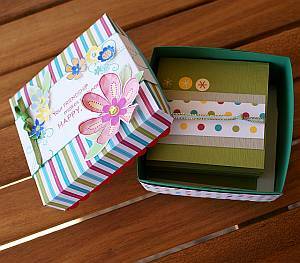 I used some of the same paper I decorated the box with to make my little handmade cards. There were some stickers that came with the paper pack that made making the cards a little quicker. I used the same basic card sketch as well - a strip of colour, an embellishment and a sentiment - for every card. How different they looked all done in different patterns and colours. I hope you will feel inspired to make some stationery boxes of your own now. And if you do, please show me what they look like. I need inspiration, too!